Lost & Found Hostel i Albufeira, Portugal: Reservér nu! 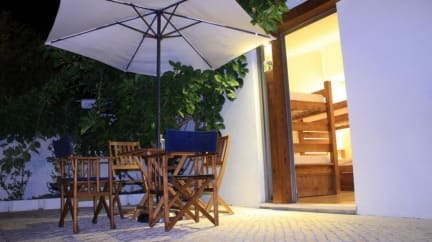 This small Hostel situated in a privileged area of Albufeira, only 2 km from the city centre and 1 km away of several beautiful beaches which have been awarded, such as the beach of S. Rafael, Evaristo, Gal (the best for practising surf), Salgados (great for kitesurfing),among others, was created thinking of the well being of our guests. This new concept was very welcomed by many people as it is a different way of doing holidays. 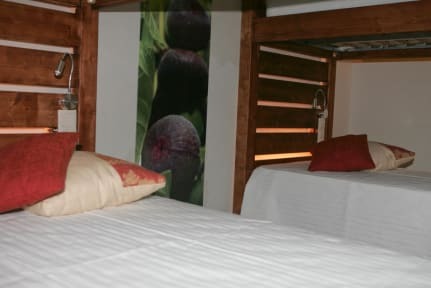 The Hostel was inspired in the surrounding area which in times was an area of a big variety of fruit cultivation. Although very close to the sea, it still is a place connected to the country side, to our roots and mother nature. In this Hostel you can find several types of accommodation, shared rooms and a double room, all with private W.C. equipped with shower cabin and air conditioning.